The Kinroad 650cc buggy is very popular among the buggy drivers. 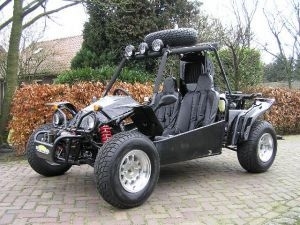 Its rugged exterior makes it attractive for many buggy enthusiasts. The look of the Kinroad 650cc is determined by the showy fenders and sporty look. The Kinroad 650cc two-cylinder engine has adequate power for many exciting hours having fun with this Kinroad monster creation. By several importers in different countries the Kinroad 650 is also known as: Wevo KXT650, Rovach GK650EC-2 and Cyclone XT650GK. The engine is also used in a Saiting 650cc. The Kinroad 650cc has no CVT (automatic transmission), but has a manual transmission. It has four gears and one reverse gear. The buggy is delivered with or without differential. It is not any less fun! On the road, it is better driving with differential, off-road without differential is a better solution.